As my Facebook news-feed fills up with “trying to come up with a Shavuos menu” statuses’, I feel this is the perfect time to post one of my most prized, favorite recipes. I mean, this is the type of recipe, that is requested by guests. If not requested, friends ask “when are you serving it?” and they want to come then. Saute onion, garlic, and mushrooms for about 5 min until golden, add cooked spinach and stir for another 2 minutes. Put aside to cool while getting fish ready. Preheat oven to 400 degrees (convection bake works best). Using a rolling pin and some flour, roll out each sheet of puff pastry until each can fit a cookie sheet. Line a cookie sheet with parchment paper. Lay one piece of puff pastry. 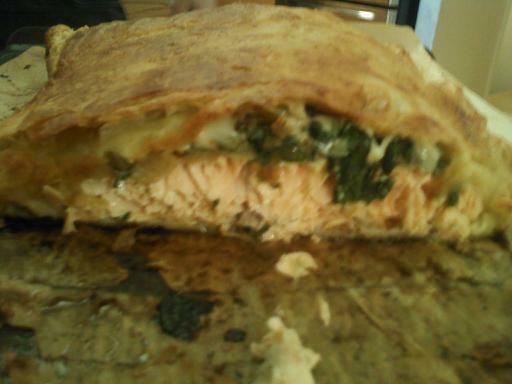 Put salmon filet so that 1 to 2 inches of puff pastry remain on each side. (you may have to cut the fillet and use the leftover for something else). Drizzle top of salmon with tiny amount of extra virgin olive oil and sprinkle with fresh pepper. Pat spinach mixture evenly onto salmon, covering completely. 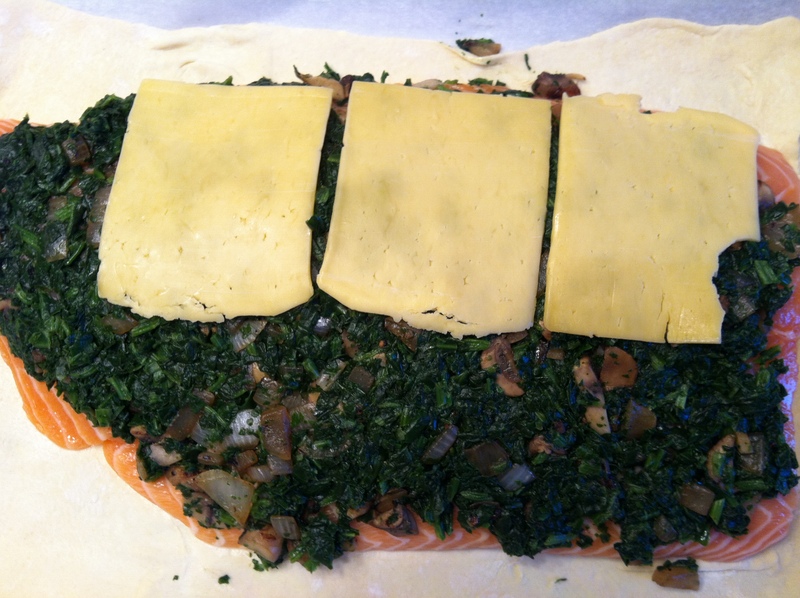 Lay pieces of swiss (or non-dairy) cheese to cover all of the spinach mixture. Make egg wash by scrambling an egg with a tablespoon of water. Using a pastry brush, brush the sides of the puff pastry around the fish. 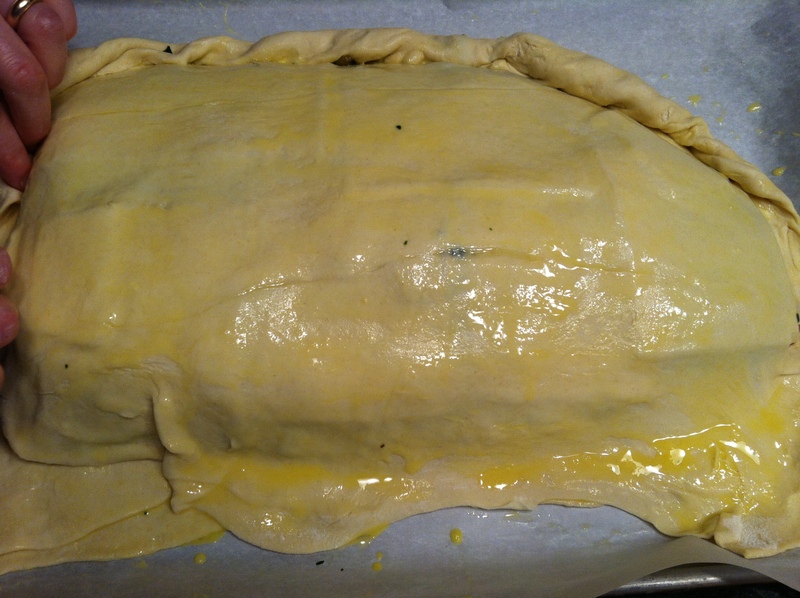 Cover the filet with the other piece of puff pastry. Brush the top all over with the egg wash. Starting at one side of the pastry, roll the dough together using a twisting motion to close up the pastry around the fish. Bake about 30 minutes until golden brown and puffy. Just thinking about this makes me hungry. It is customary to eat dairy on Shavuos, so this meal fits right in. For more information on this custom, click here. To easy meal-planning and bright raesofsunshine for Shavuos!